Lets start this installment of "The Worlds Best Audio System" with a few generalizations. An Audio Note Gakuoh owner would not trade her single-ended 30W amplifiers for 1000W Krell Master Reference monoblocks. A Wilson Audio Specialties customer is not likely to convert to Edgarhorn ownership. 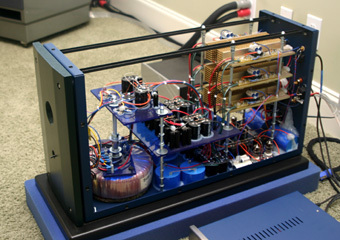 The man who would buy a Blue Circle amp/preamp combo would not buy a setup from Halcro. Such is the nature of high-end audio. Audiophiles like to follow designers, adopting as their own the designers vision of what good sound and proper componentry is all about. Vladimir Lamm and his loyal customer base are a prime example of this. I cant think of a second, more clear-cut case of this phenomenon than Blue Circle Audio and its almost cult-like following. Gilbert Yeung, Mr. Blue Circle himself, is firmly entrenched in his own world -- almost literally. He operates his business from a secluded 100-acre parcel of land in Innerkip, Ontario, Canada. When you get a Blue Circle, youre also getting a Gilbert. If you buy a BC206 amplifier ($10,295 USD), for example, Gilbert will build it himself, test it himself and maybe even put it in the box himself. He does have employees who perform certain functions, but they dont do any design work or build his top-tier equipment. When you buy a Blue Circle component, you are also adopting the Gilbert Yeung philosophy. While Gilbert delivered and set up the review samples written about here, I had an opportunity to get to know him a bit, and in doing so, I began to understand, for the first time, the lure of Blue Circle Audio. The components themselves are hand-fabricated. Dont expect Rolex-like audio jewelry; if thats what you want, look elsewhere. Instead, Blue Circle products are like custom-built rocking chairs created by a life-long woodworker. They just couldnt be built by machine and remain what they are. Because Blue Circle amps and preamps are built one at a time, theres personality built into them that you wont find in run-of-the-mill gear. Some of the materials seem odd. The faceplate and base of the BC206 amplifier are made from MDF. Gilbert says it doesnt ring like certain metals. The damping materials used internally in all of Gilbert's products can be found at any hardware store, not in a NASA lab. Gilbert says they work perfectly for their intended purpose. Just because some of the materials are common, dont think they all are. The Blue Puck Cap capacitor, with its high-current, large-diameter leads, are as custom -- and as expensive -- as youre likely to find in any audio component. Gilbert claims that the response of these caps is 25 times faster than that of ordinary high-speed capacitors. Heres an example of where an exotic part makes a sonic difference, so Gilbert uses it. You can ask for custom finishes on many of the Blue Circle products -- far beyond the silver and black options that many companies offer. I especially like the blue top cover that came on the BC3000 Mk II preamplifier ($6495 single-ended, $7095 balanced). The upshot is that the approach to Blue Circle gear is solely at the discretion of Gilbert. You might find an exotic part right next to a common household material -- and you have to take it on faith, until you hear it for yourself, that what he says works best actually does. Will you like the Blue Circle approach to hi-fi components? Experience will tell. Gilbert Yeung (left) describes the intricacies of the BC206 amplifier to Jeff Fritz. The 118-pound BC206 is a hybrid, fully balanced design that produces 180Wpc into 8 ohms and 360Wpc into 4. The hybrid designation is due to a tube input stage, with the output stage being pure solid state. 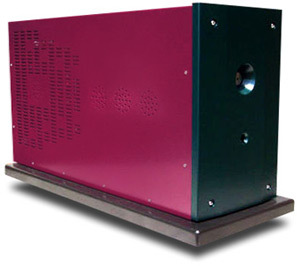 It is a vertically oriented amplifier, taller than it is wide and very deep (13"W x 18 1/8"H x 31 3/4"D). According to Gilbert this arrangement makes it efficient at dissipating heat. As previously mentioned, the base and faceplate are MDF, but the chassis is 12-gauge steel. The one-piece damped top/side piece pulls off like a shroud, revealing the complex-looking inner workings. Front and center is a 1300VA transformer that appears huge for its rating. A discussion of how transformer makers rate their devices ensued once I commented on this, and Gilbert confided that other manufacturers might rate his 1300VA unit at 2000VA. Looking at the size alone, Id say hes probably correct, and this goes a long way toward illustrating his no-nonsense, no-BS approach to audio and business. The supply capacitance is specified at 375,000 microfarads, with each capacitor sitting in a bed of silicone for damping. The output stage is located on three tiers above the ground floor, with each tier suspended on metal rods. About 95% of the interior construction is point-to-point wired. Youll see no massive circuit boards stuffed with parts. This is obviously a labor-intensive product to build, but then all Blue Circle products follow this methodology to some degree. The rear-panel facilities consist of dual sets of heavy-duty binding posts, balanced and single-ended inputs, and, most usefully, a ground-lift switch that disconnects the signal ground (the chassis is still grounded for safety purposes). If youve ever experienced a pesky ground-loop hum, youll know how useful this switch can be. Rounding out the backside is a 20A Neutrik Power Con connector for AC connection. A hefty 10AWG BC62 power cord is included with the BC206. The BC3000 Mk II is a direct descendant of the original BC3 preamplifier. Its currently available in several different iterations, with differences being in the actual circuitry as well as the complexity of the power supply. The BC3 Despina Mk II ($3495) is the entry-level unit in the line, but it is upgradeable to the model under consideration here. The BC3000 Mk II I received is the top model in the range. The main chassis is 17 1/2"W x 3 1/4"H x 14 1/2"D and weighs 37 pounds. Thats quite substantial when you consider that the power supply (designated the BCG3.1 Mk II) is housed in a separate chassis (6"W x 5 3/8"H x 14 1/2"D, 16 pounds). The review sample came supplied as a fully balanced, dual-mono version sporting three sets of XLR-equipped inputs, two sets of XLR outputs, and a single tape loop also on XLRs. The front panel is about as minimalist as you can get. There are right and left volume controls and input selectors, along with two loop switches. The interior of the dual-triode class-A BC3000 Mk II is a maze of suspended-in-air, point-to-point-wired circuitry, along with a mass of parts. Youll find 1% metal-film resistors, HexFred rectifiers, and high-speed power-supply capacitors. The rear panel, along with all of those XLRs, features polarity-inversion switches. High and Low gain settings are accessible under the top plate for matching to the owners system. This results in a total of 62 potential volume settings (32 with each setting). The stainless-steel-encased power supply is connected to the main chassis via a supplied umbilical. And finally, you can order the BC3000 Mk II with a number of optional knob colors/materials as well as top plates and faceplates in a multitude of colors and materials. Both the BC3000 Mk II and the BC206 are burned-in for a minimum of 50 hours before leaving the factory. Gilbert inspects each unit himself before it enters the shipping container and finds its way to its new owner. Oh, and if you want other options such as a home-theater bypass, just call him. There is a Blue Circle sound, but dont let this fact dissuade you from assessing its worth. Sometimes a sound can reveal more about your music, at least certain aspects of it. The first sonic characteristic I noticed is a midrange that pops right from the soundstage in a most obvious way. These Blue Circle components will give you one of the most nuanced and expressive midranges youre likely to hear from any gear. Mind you, its not disjointed in any way. Its all cut from a single cloth and perceptibly more human and up-front. With music like Eva Cassidys Live at Blues Alley [Blix Street GS-10046], the vocals became even more intimate-sounding than Ive heard through finely bred solid-state amplifiers. Its almost as though the singer moved just a touch closer to the audience. I cant really think of an instance where during the review period this sonic characteristic was a bad thing; the midrange character didnt add any coloration to the human voice no matter how many cuts I played. It was just that vocals were displayed a bit more prominently in the soundstage. The other strength the BC206/BC3000 Mk II combo displayed was a seamless transition to both the high and low frequencies from that all-important midrange. There was musical cohesion, not unlike what I heard with the excellent Lamm M1.2 Reference amps. One of Vladimir Lamms amps strong points was an analog (in the best sense of the word) sound that was expressive yet natural. The Blue Circle gear pulled off much the same trick. Dead Can Dances Into the Labyrinth [Virgin 45384-2] weaves a web of intrigue that will haunt you. It also spans the frequency band in a way that will reveal discontinuities introduced by your sound system. The BC206 and BC3000 Mk II had no problems presenting this music with all of its elements intact. Lisa Gerrards vocals intermingled in a most natural way with the instrumental components of the mix. Bass was full and round, but still powerful and driving. I was surprised on more than one occasion, as when listening to Loreena McKennitts "The Mummers Dance" (The Book of Secrets [Warner Bros. 9 46719-2]), with the ability of the BC206/BC3000 Mk II combo to plumb the depths with the big Wilsons. The bass was not of the vice-grip, tight-as-a-drum variety, but it was deep and taut nonetheless. Ive heard electronics that start and stop in quicker fashion than the BC206/BC3000 Mk II combination, like the Halcro dm68/dm8 pairing, but some listeners, I know, feel that this is not wholly natural, either. Id have preferred a bit tighter sound in the bass myself than the Blue Circle equipment provided, but that observation only came to mind with a very few select recordings. Whether you prefer Halcro bass or Blue Circle bass will require an individual assessment -- within your system and while taking into account your personal tastes. The seeming dichotomy is this, as it applies to bass performance with these two fine amplifiers: Both brands do what they do exceptionally well with little to criticize, but Id bet that if you like one youll not take to the other, as I said in the opening paragraph. Electronics come and go. I should know, as Ive had more than my fair share through here in the past year. The bar -- as set when my Wilson Alexandria X-2s were setup last November -- was initially placed quite high with the Halcro dm68 monoblocks ($37,900) and matching dm8 preamp ($11,000). In some respects, namely their vanishingly low noise floor and extremely nuanced high-frequency air, they still set the standard. However, I commented in the last "TWBAS" that Id rather listen to the Gryphon Antileon Signature ($24,000) and its matching Sonata Allegro ($12,000) preamplifier over the long term. Eminently powerful and with as expansive a soundstage as Ive heard, the big Danes were a joy to live with. They had more absolute drive and grunt than the Halcros, though they were noisier and less precise in absolute terms. The Lamm M1.2 Reference amps ($20,450) were about the most natural-sounding amplifiers Ive experienced. They had an organic sound in my setup that made me forget all about electronics, even if some of their individual performance characteristics werent overwhelming. All of the amplifiers and preamplifiers Ive recently heard and written about here cost a bundle, making the Blue Circle BC206/BC3000 Mk II duo look like a bargain by comparison. But make no mistake -- the Blue Circle combo, in terms of musical enjoyment, definitely stands shoulder to shoulder with the above-mentioned heavyweights. Their sound most closely resembles that of the Lamm amps -- the midrange magic and seamless transition between the frequency ranges is a must-have once youve heard it. Their bass is not as tight as that of the Halcro and Gryphon combos, but the BC206 and BC3000 Mk II easily reach as low as either of the other beasts. The high frequencies of the BC206 and BC3000 Mk II dont extend into the stratosphere like the Halcros', either, but they are less offensive with brighter-sounding recordings. So perhaps thats an acceptable tradeoff. The Blue Circle soundstage is expansive -- only bettered by the Gryphon duo and matching that of either the Lamm amps or the Halcro separates. I see the Blue Circle BC206 and BC3000 Mk II as special members of the super-component club. They compete at a very high level, besting some more expensive brands in some respects while not being embarrassed even in their weakest areas. Youll have to decide whether the unique Blue Circle sound is what youll fancy over the long term. Youll also have to determine whether or not you want a hand-built personal statement from Gilbert Yeung. What I can definitively tell you is that youd be neglecting some awfully fine electronics if you dont hear the BC206 and BC3000 Mk II in your home. And while youre at it have a talk with Gilbert about his designs. If he ever stops building them youll likely never see any resembling them again -- I cant say that about much of the equipment on the market today. There wont be an overseas knockoff of the BC206 and BC3000 Mk II available for a quarter of the price. Although Ill hate to see these review samples leave, Im sure Ill keep up with Gilberts work from here on. These components made that much of a positive impression and have shattered some nasty audiophile generalizations in the process.